Envoy Captain Chris Wharton (left) with frequent flyer Laura Jozwiak (right). On a regular basis, customers flying on American Eagle flights operated by Envoy Air will reach out to us to give our hard-working customer service agents their due praise. Whether it’s a flight attendant, gate agent or pilot going above and beyond, we love to hear that we’re doing our job safely and professionally. I was recently traveling on a pretty typical flight, but had an atypical experience. 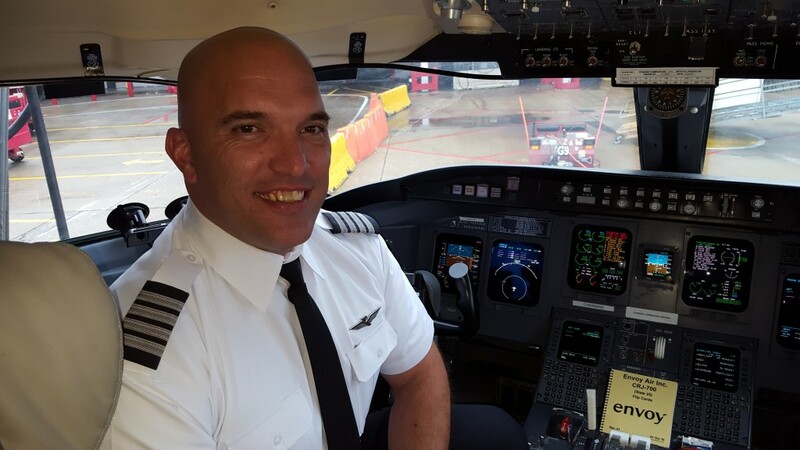 As we settled into our seats and turned off our cell phones, the Captain greeted us. Only it wasn’t over the loud speaker, it was in person. “Welcome to American, I’m Captain Chris. Anyone been to Colorado before? Anyone been on one of my flights before? Anyone ski? I just took up skiing a few weeks ago and believe me, you will appreciate falling into all the fresh fallen snow.” And while this exchange only lasted a few minutes, he engaged all the passengers while providing some insight about himself, his personality and interests. In just a few short minutes, we got to know Captain Chris much better. But he didn’t stop there. He proceeded to personally introduce himself to each person on the flight – shook their hand, asked their name, and even razzed some of those wearing particular football jerseys. It was all very natural to him, but so unnatural for all of us. But think about it. Shouldn’t we know a bit more about the person who is about to propel us into the air at 500 miles per hour? Should we at least get to see a display of confidence? Isn’t it nice to know something personal about them? Instead of being cut off from the passengers without even a hello or thank you, Captain Chris showed that he cared about us. And I liked it! His engagement left a very positive impression on all of the passengers that day. Although the Wi-Fi didn’t work, the flight was bumpy, and the person in front of me got a little too comfortable in their seat – it was all okay. Captain Chris delivered us there safely and on time, just like he said (in person!) he would. It took only ten minutes to welcome the passengers, but the impact will be felt much longer. I can’t help to think he might have inspired a child to be a pilot that day or helped calm a nervous traveler. For me, he demonstrated the importance of a simple gesture, and when that is not expected it translates to superior service. Laura Jozwiak is the Senior Vice President of Sales and Client Relations at Wheels, Inc. She oversees Wheels’ Sales, Account Management, Client Services, Client Relations and Client Analytics teams, which provide strategic guidance and analytic resources to assist Wheels’ clients in making informed decisions that improve the performance of their fleets.